Diego Rivera is one of Mexico’s most famous artists. He was born in Guanajuato in 1886 and rose to world-wide fame in the 1920s behind the strength of his large murals. His fiery relationship and marriages to fellow artist Frida Kahlo have been the subject of many books and movies. We visited Mexico City in May 2016 with the goal of seeing some of the many Diego Rivera murals that are found throughout the city. Here’s a sample of what we saw, plus places we missed and hope to see in the future. 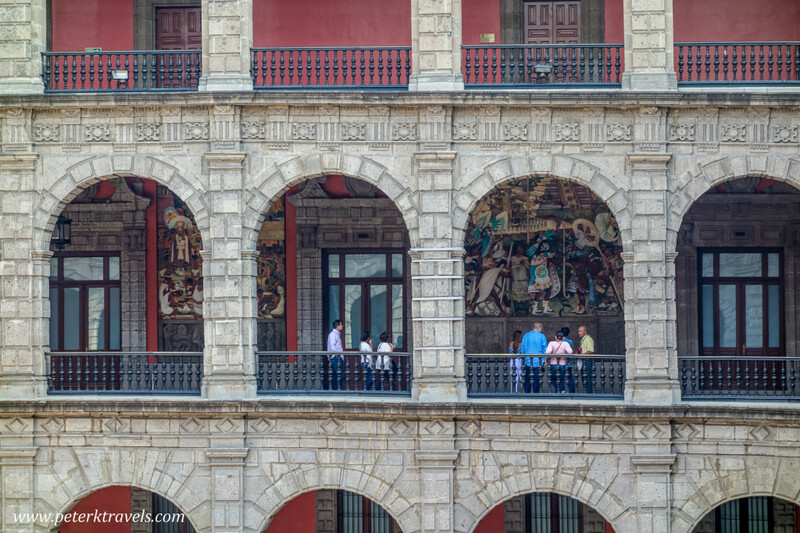 The National Palace takes one entire side of the Zocalo in the Centro Historico. 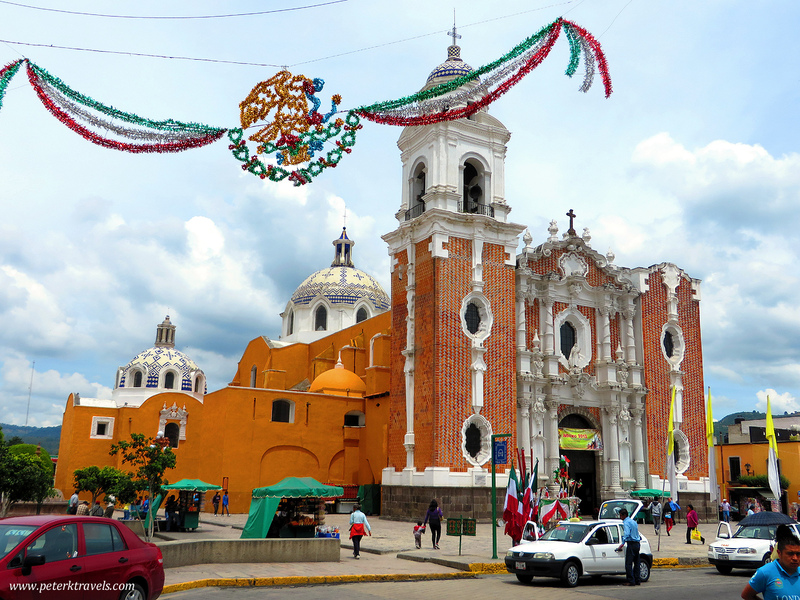 This beautiful building was built on the ruins of the Moctezuma’s palace. 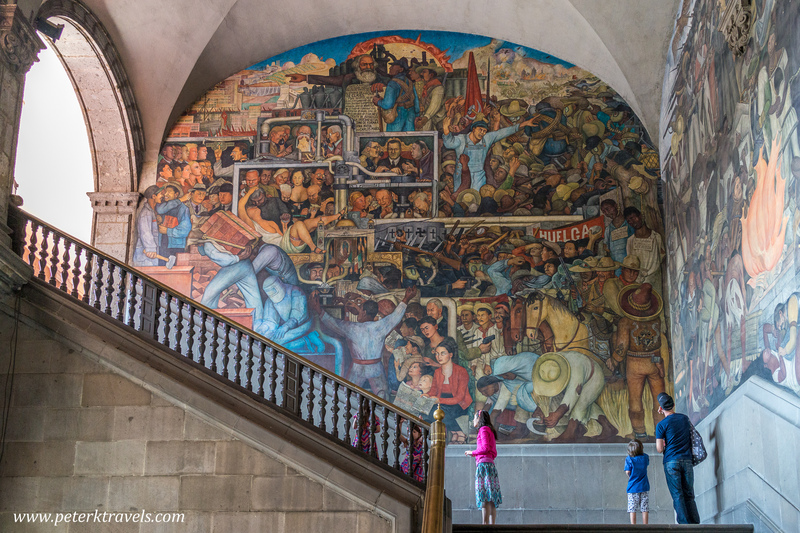 The building houses many government functions, and also Diego Rivera’s “History of Mexico” mural in the main stairwell. It is free to enter the National Palace, but identification is required. They held my passport and backpack at the door while we toured the building. Photos are allowed, without flash. 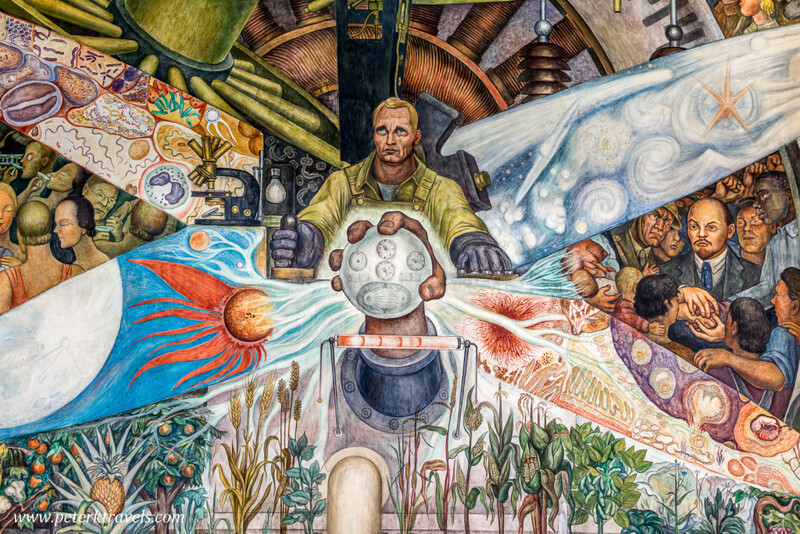 In addition to the Rivera murals, there are also gardens and other areas of interest. The outside is beautiful, and there’s a famous Rivera mural inside — Man at the Crossroads. Originally designed for Rockefeller Center in New York, it apparently offended Rockefeller, and he had it destroyed. Rivera re-created it here some years later. There’s a nice description at Wikipedia here, and a photo here. I regret missing this, I will make sure to see it next time I am in Mexico City. Located just a few blocks north of the Metropolitan Cathedral, we entered from the side that faces the Plaza Santo Domingo. It was free, they did perform a cursory search of our bags and asked us to sign in. There are three floors of murals. Photos are allowed, no flash. 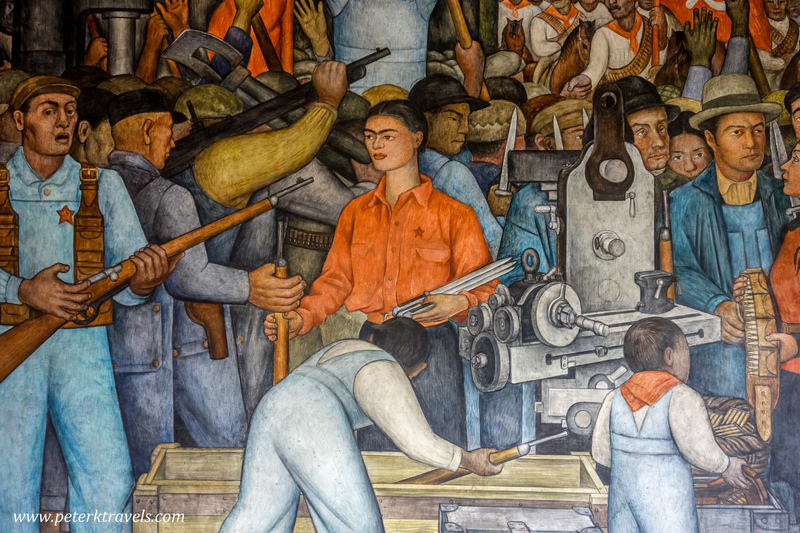 There are 235 panels of Diego Rivera’s work, centered on themes such as the Mexican Revolution and workers (steel, agriculture, etc). The murals are dated mostly around 1928-29. The sheer volume of work here is truly impressive. 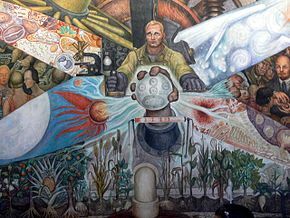 Diego Rivera Mural, Secretariat of Education Building — Is that Frida? 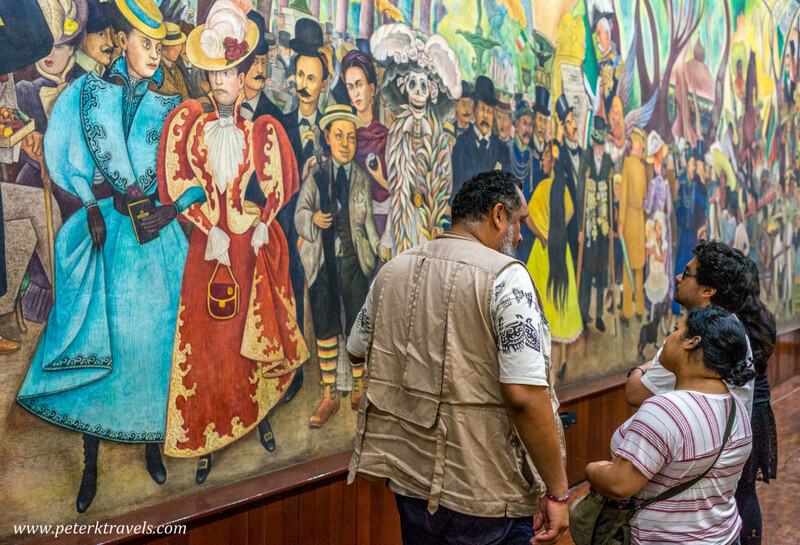 This museum was constructed in 1986 to house one of Diego Rivera’s most famous works, Sueño de una tarde dominical en la Alameda Central (Dream of a Sunday Afternoon in the Alameda Central), painted in 1947. 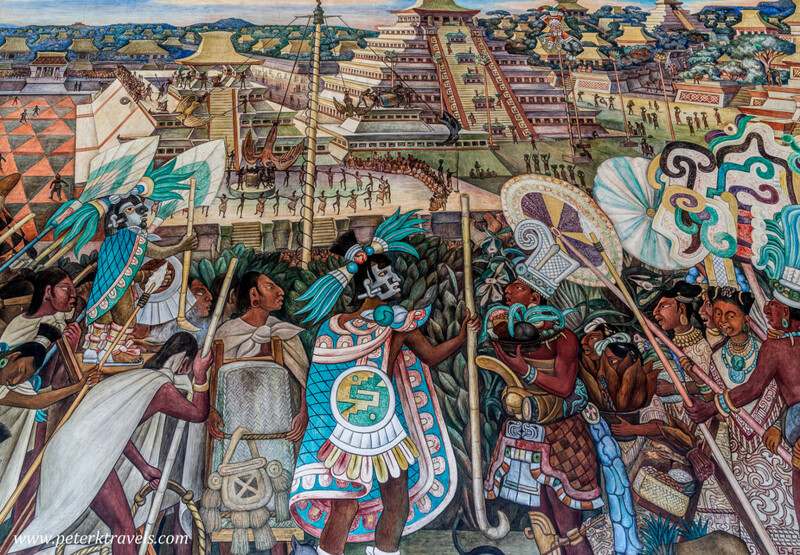 Rivera painted many of the figures who had walked in the city from colonial times onward. 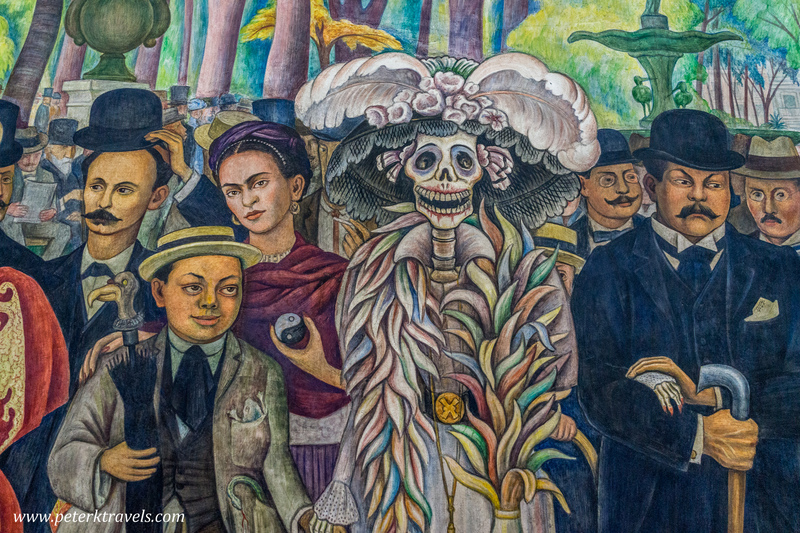 Rivera painted himself as a child, he and Frida Kahlo stand beside a Catrina. In the back of the room, there is a guide that identifies all the characters in the mural. The original home of the mural, the Hotel del Prado, was wrecked by the 1985 earthquake. In the basement of the museum are photos showing how they moved the mural to this location. The museum was free when we visited on a Sunday. Photos are allowed, no flash. Bags must be left at the front counter at a cost of $5 pesos. More information on hours and costs can be found here. This was my favorite mural. It’s truly spectacular. 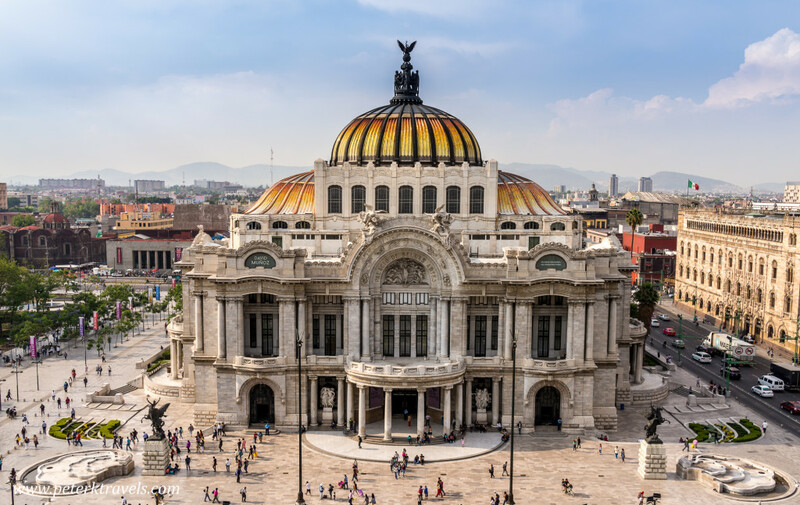 Located outside of the Centro Historico near the Polanco neighborhood, the Soumaya is the home of Carlos Slim’s art collection. 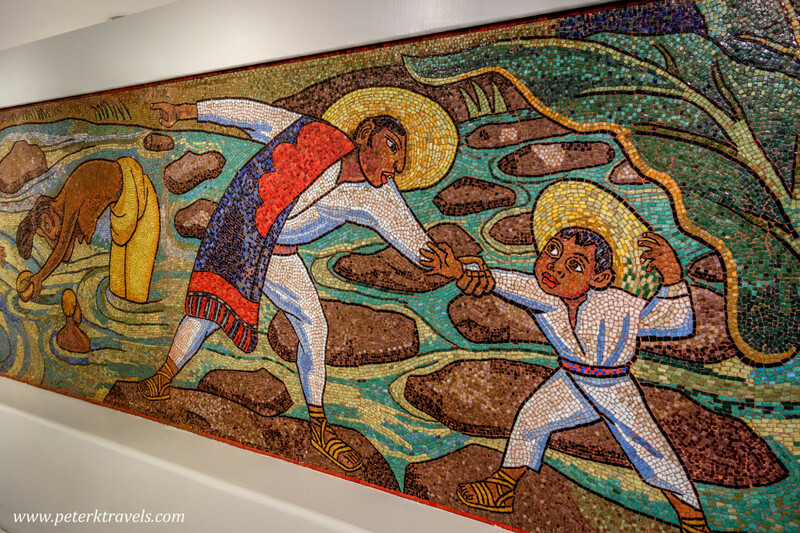 There is a Diego Rivera mosaic on the first floor. The museum is free, bags need to be checked, and photography is allowed (no flash). There are lots of other things to see at the Soumaya — including the building itself, which is very interesting. There are impressionist galleries, Rodin sculptures, and much more. The museum website is here. We had every intention of making it here, but ran out of time. 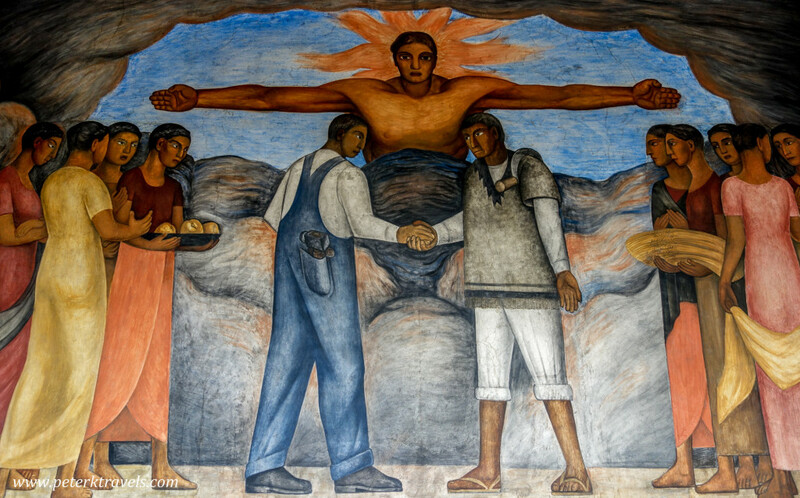 The building houses Rivera’s first mural, La Creación, undertaken on his return from Europe in 1923. 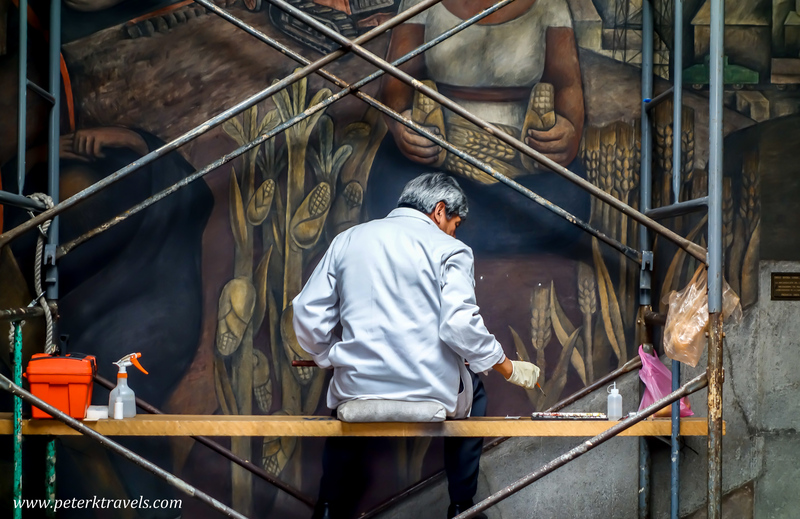 Located in Coyoacan, Frida Kahlo was born here, and lived here with Diego Rivera for a number of years. It’s a popular tourist destination, one we didn’t have time for. The home contains a collection of artwork by Frida and Diego, as well as photographs, memorabilia, personal items, and more. More information can be found here. Located in Xochimilco, we did not attempt to visit as a notice on their website indicated much of the Frida and Diego collection was on loan to a museum in Russia. 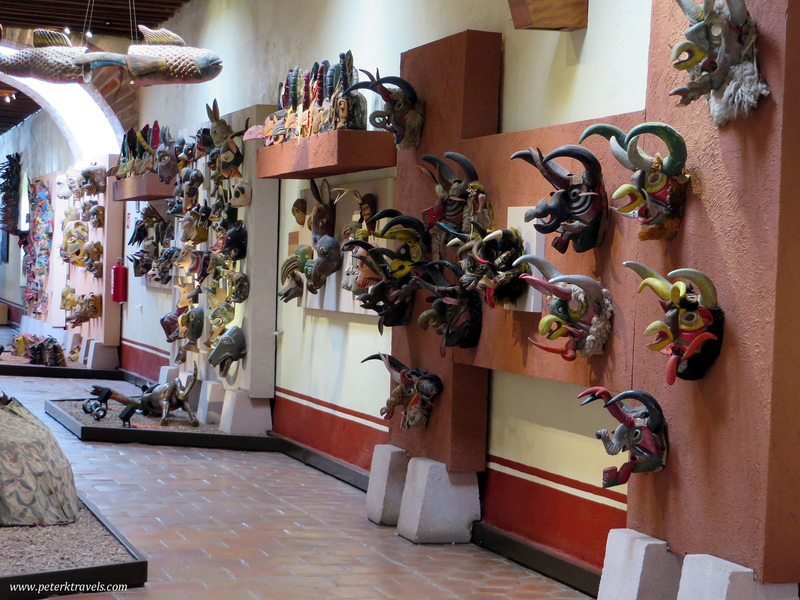 They have a large collection of Diego Rivera and Frida Kahlo works. The museum website is here.